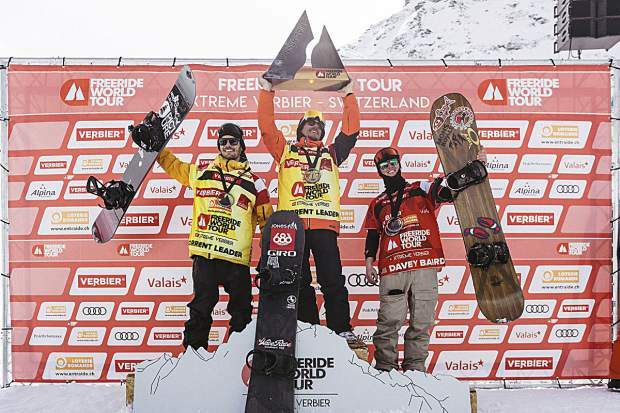 Sammy Luebke stands atop the podium in Verbier, Switzerland. Luebke’s win gave him a three-peat of the overall series championship. The Squaw Valley product will begin his quest for a fourth straight championship this weekend. Three-time reigning Freeride World Tour champion Sammy Luebke, of Truckee, will begin defense of his title this weekend in Hakuba, Japan. Luebke, 29, managed to come back from injuries last season to defend his title. The Squaw Valley product will hit the snow in Japan for the first run of the season on Saturday. Last year’s winner at Hakuba, Truckee’s Jonathan Penfield, will also return for another season of riding on the world tour. Penfield, 31, finished last season as the sixth-ranked male snowboarder on the tour. The competition in Japan can be viewed live via FreeRideWorldTour.com and the tour’s YouTube and Facebook pages. The first round of action of the Tahoe Junior Freeride Series was held last weekend at Sugar Bowl Resort, bringing more than 100 skiers and riders to The Nose for the season-opening competition. The series opened on Saturday with skiers and riders ages 12-14 taking to the course. Sugar Bowl Ski Team & Academy’s Hayden McJunkin picked up the win in the girls’ skiing division, while Squaw Valley Big Mountain skier Matt Seline took the win on the boys’ side. In boys’ snowboarding, Ryland Morrison captured first place for the Squaw/Alpine Snowboard Team. Auburn Ski Club’s Ellery Manning was the lone girl in her field, resulting in a first-place finish to open the season. Competition continued the following day at The Nose with the ages 15-18 skiing and snowboarding events. Squaw Free’s Britta Winans took the win in skiing to start the year, outdueling teammate Lily Bradley. Sugar Bowl’s Tallulah De Saint Phalle was third. On the boys’ side, Alpine Big Mountain riders dominated the field with the top three scores. Evan Loring led the way, followed by Jeremy Pascal and Westan Lubin. In snowboarding, Nathan Bromley defeated a handful of Squaw teammates for first place in the boys’ division. Tavo Sadeg was second and Adrien Babet was third. There were no girls in the age group competing on snowboard. The Tahoe Junior Freeride Series will next head to Kirkwood Mountain Resort for the second round of competition on Feb. 2-3. For more information, visit TahoeFreeride.org. The United States of America Snowboard and Freeski Association North Tahoe Series returned to Boreal last Sunday for the final rail jam event of the season. Northstar Ski Team’s Noah Rodarte threw down enough style and tricks to take the win over Truckee’s Sawyer Coll in the freeski 14-and-over division. Incline Village’s Jaret Cross was third. In the open competition, Truckee’s Zachary Poulin picked up the win on the men’s side, and Marea Adams, of Truckee, competed as the only woman, taking home the first place points. The boys’ 10-13 division was among the biggest of the day, and was won by Truckee’s Mack Winterberger, who topped local skiers Seamus Colborn and Tyler Poulin. In the youth competition, Will Hasselman, of Los Altos, walked away with the win on the boys’ side, and Truckee’s Abby Winterberger took the win for the girls. In snowboarding, Northstar rider Jonah Marquart took first in the largest field of snowboarders, picking up the win in the boys’ 10-13 division over Elias Boger, of Saratoga, and Northstar’s Jace Knight. On the girls’ side, Nadia Harper-Herbold took the win over a handful of competitors in the 10-13 age group. Truckee riders Elena Schipani and Misaki Vaughan were second and third, respectively. Reno snowboarders Cole Sorensen and Ella Sorensen took wins in the 14-and-over division’s boys and girls’ events, respectively. In the youth events, Matthew Laboda, of Chester, took first place on the boys’ side and Kori Hong, of Palo Alto, won the girls’ competition. The North Tahoe Series will now switch gears and head to Northstar California Resort for slopestyle on Jan. 26. For more information, visit NorthTahoeSeries.com.